The Financial Risks International Forum on “Low interest rate environment: search for yield, risk management and transitions” is an International Research Forum for academics and professionals organized by the Louis Bachelier “Finance and Sustainable Growth” Laboratory. We invite academics, professionals and regulators to submit research papers for this event, which will take place in Paris on 18 & 19 March 2019. Interest rates in the major developed countries are at historically low levels, and risk premia of traditional asset classes have fallen significantly. In this environment, banks, insurance companies and institutional investors face the challenge of generating sufficient returns to meet their commitments. They are tempted therefore to turn to alternative asset classes or riskier investment strategies. The reduction of yields leads to competitive pressure on costs and the emergence of new, less regulated players. This situation, exceptional by historical standards, raises important questions with regard to interest rate modelling, the effectiveness of monetary policy, the creation of appropriate stress tests, risk-taking behaviour by financial institutions, and the impact of low rates on price trajectories and financial stability. The aim of the 12th Financial Risks International Forum is to highlight the methodological and regulatory challenges confronting financial players in a low interest rate environment and the transition to a ‘new normal’. 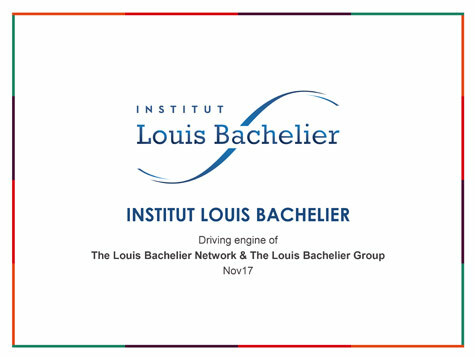 Expenses: The Institut Louis Bachelier may cover part of travel and accommodation expenses for the authors of the papers selected (upon request and subject to the decision of the Scientific Committee, and for speakers only). • Yield curve modelling in a zero or negative yield environment. • Term structure of risks, lift-off probabilities, short vs. long-run risks. • Monetary policy effectiveness, stress tests, financial stability. • Search for yield in portfolio construction: alternatives and illiquid assets, smart beta, active vs. passive, systematic portfolios and indices, leverage. • Design of fixed income and money market funds. • Impact of low interest rates on banks’ and insurance companies’ balance sheets, risk-taking behaviour. • Asset liability management for pension funds and insurance companies. • Financial innovations and the emergence of new players (Fintechs such as digital lenders, private bond, student loans placement platforms, etc.). Chairwoman: Marie BRIERE, Amundi, Paris-Dauphine University and Université Libre de Bruxelles ♦ Frédéric ABERGEL, Ecole Centrale Paris ♦ Jean-François BOULIER, Af2i ♦ Laurent CLERC, Banque de France ♦ Rama CONT, CNRS – Pierre et Marie Curie University ♦ Michel CROUHY, NATIXIS ♦ Raphaël DOUADY, University Paris 1 Panthéon-Sorbonne, CNRS and Riskdata ♦ Darrell DUFFIE, Stanford University ♦ Nicole EL KAROUI, Pierre et Marie Curie University ♦ Christian GOURIEROUX, CREST – Toronto University ♦ Roger GUESNERIE, Collège de France ♦ Alexander HERBERTSSON , Göteborg University ♦ Monique JEANBLANC, LaMME Evry University ♦ Jean-Paul LAURENT, Paris 1 Panthéon-Sorbonne University ♦ Guillaume PLANTIN, Toulouse School of Economics ♦ Jean-Charles ROCHET, Zurich University ♦ Olivier SCAILLET , Geneva University ♦ Bertrand VILLENEUVE, CREST – Paris-Dauphine University.